Very Interesting Totem to old School Video Games.. I love Pong at the bottom of the tattoo. I love the Duck Hunt Guns Tattoo, I think I have another one laying around somewhere with the DuckHunt guns in the Pants holster. (You know you have seen the Tattoo before, where the guns are tattooed near the pants line. WTF? 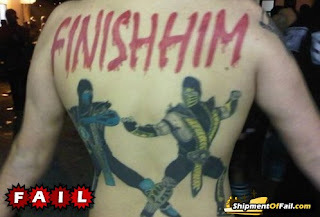 Really, you are going to live the rest of your life with that crap on your neck. 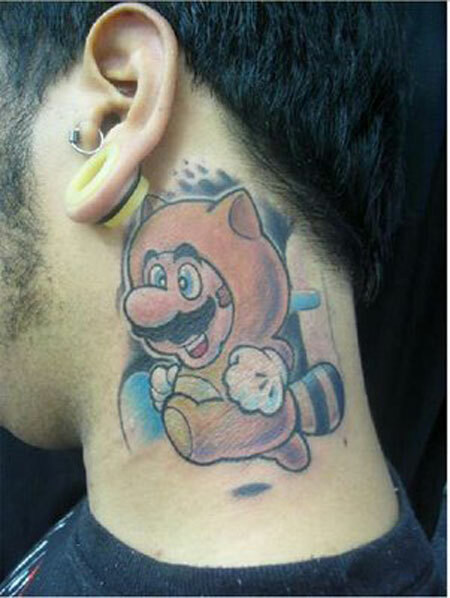 Unreal.. Unreal, Dude its your neck and you put Mario on it. 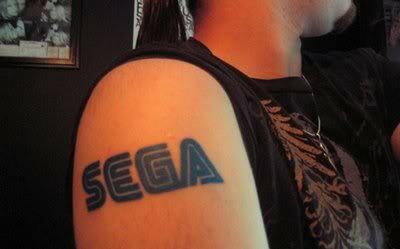 This tattoo was old when he put it on, I bet he never thought that Sega would die out and another company would become "better" than sega. 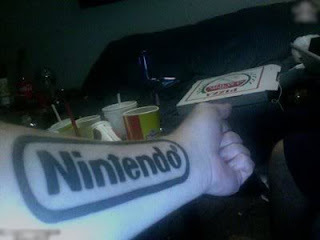 Nintendo arm tattoo.. Oddly it points to where his life will never progress from now that he has the tattoo.. In 30 years he will still be alone eating pizza in his apartment. 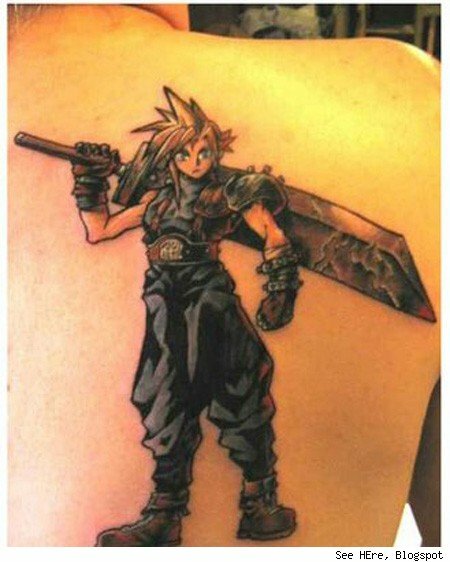 Perhaps his mother can clean it up for him. Looks like an ankle, good place for it. I like that it is small, a little homage to his favorite game and not so ridiculous as many of the others in this category. 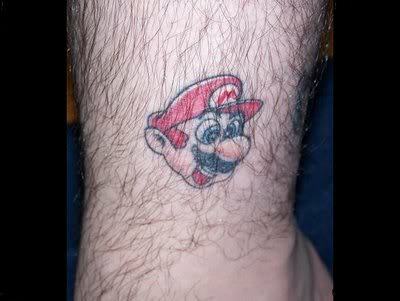 I should not need to repeat this.. DUDE you only have ONE back.. and Mario, well.. 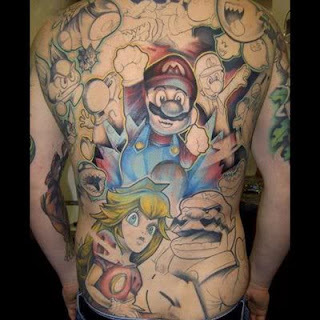 It was Mario.. Not full back worthy.. For future reference please check with the guy in the above pic for advice on how to love a game and show it. I think you went a little over board, seriously a full back tattoo with Mario and the princess from Mario Bros. Guy at Club: "I have an idea"
Chick in this pic: "Sure what is it.."
Guy at Club: "Lets go back to my place and see what happens"
Chick in this pic: "Well I don't know.. ,ok I guess.. you seem like a nice guy.."
Guy at Club: "Let me help you "get comfortable and get this shirt off"
Guy at Club: "Holy Sh!t is that a PacMan tattoo on your chest?? WTF!!" Chick in this pic: "Well my EX-BF would not stop playing video games and I thought it would help our relationship.."
Chick in this pic: "Yes I play that too.."
What can I say.. 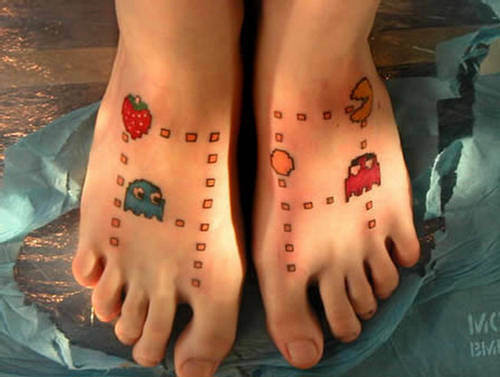 I like feet tattoos and I like Pacman..
A really good list of tattos. As a gamer, I am proud of them haha. 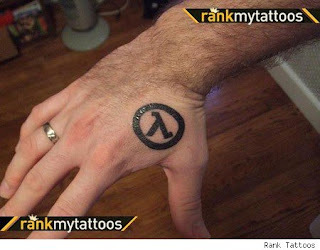 Anyways, I might get a tattoo of Half Life on my hand too. Hope it will look good.